There’s no denying that a straighter smile is healthier and easier to care for. Properly aligned teeth can reduce your risk of problems like TMJ disorder, tooth decay, and even gum disease. How to get your teeth into the perfect alignment may be the biggest choice to make: should you go with conventional braces, or opt for a removable design such as Invisalign? Conventional braces are appropriate for just about any age, whether you’re an adult with a fully developed smile or a younger child who is still losing a tooth here and there. Although traditional orthodontics are usually made of hypoallergenic metal, there are now options for cosmetic or ceramic brackets that blend in better with your teeth. Invisalign Orthodontics: Clear, Removable, but Right for Everyone? The majority of our Milton Invisalign patients choose these braces because the translucent aligners are essentially “invisible” to other people, and they can be removed for more freedom to eat, brush, and floss. Unfortunately, Invisalign also calls for strict dedication on the part of you or your teen. If you feel that it may be challenging to remember to wear the aligners for a minimum of 20 hours per day and change them out as prescribed, then a fixed braces option may be more appropriate. You know yourself (and your teen) better than anyone: are you up to the task of overseeing your orthodontic treatment at home? At Hawthorne Village Dental Care, we offer in-house orthodontic therapy for adults, teens, and children. 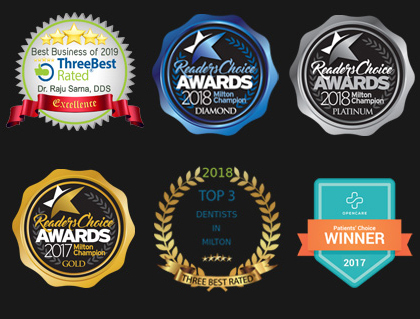 Our Milton family dentists will meet you with you personally to discuss the advantages of each type of braces as they relate to your specific situation and needs. To learn more — or find out if you’re a candidate for Invisalign or conventional braces — contact us today to book a complimentary orthodontic evaluation. New patients welcome!